ARABIC: Aqîd hindî, Hurd, Kurkum, Timmer (Egypt). BRUNEI: Kunyit, temu kuning, temu kunyit. CHINESE: Yu jin, Jiang huang, Huang jiang, Yu chiu, Yu chin, Yu jin. DUTCH: Geelwortel, Indaansche saffraan, Kurkuma. 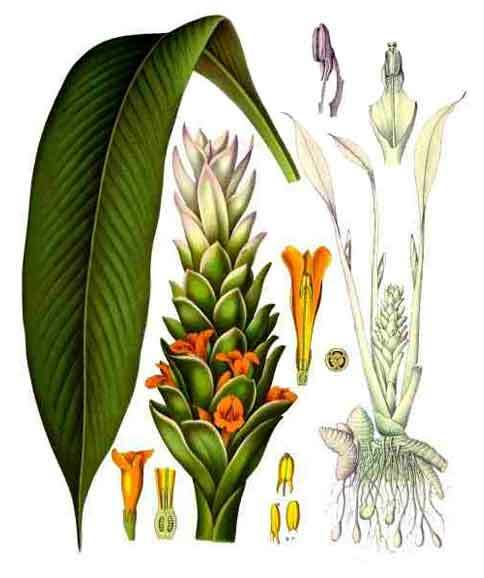 FRENCH: Arrow-root de l'Inde, Curcuma long, safran des Indes, turmeric, Safran du pays, Safran-cooli. GERMAN: Gelbwurzel, Gelbwurz, Gilber Ingwer, Gilbwurzel, Indischer Safran, Kurkuma. ITALIAN: Croco indiano, Curcuma di Levante, Curcuma lunga, Radice gialla, Safferano dell Indie. LAOTIAN: Khi min, 'khmin 'khun. MALAYSIA: Kunyit, temu kunyit, tius. PAPUA NEW GUINEA: Lavar, tamaravirua. RUSSIAN: Kurkuma dlinnaia, Kurkuma domashniaia, Kurkumy koren', Turmerik. SPANISH: Azafrán de la India. THAILAND: Khamin, khamin kaeng, khamin chan, Kha min hua. TURKISH: Hind zafrani, Kurkim, Kurkum, Zerdé djavé. VIETNAMESE: Khuong hoàng, Nghe, Uâtkim. Dilaw is a leafy plant, 1 to 1.5 meters tall, with 5 to 6 leaves. Rhizomes are bright yellow inside, thick and cylindric. Leaf blade is green, oblong, 30 to 45 centimeters long and 10 to 20 centimeters wide. Petiole is as long as the blade. Peduncle is 15 centimeters or more in length, borne within the tuft of leaves. Spikes are 10 to 20 centimeters in length and about 5 centimeters in diameter. Floral bracts are pale green, ovate, 3 to 4 centimeters long, the comabracts tinged with pink. Flowers are pale yellow, as long as the bracts. Fruits are capsules. - Widely distributed in the Philippines in and about towns, sometimes in open waste places and sometimes planted. - Active constituents are flavonoid curcumin (diferuloylmethane) and various volatile oils, including tumerone, atlantone, and zingiberone. - Volatile oil, 3-5% - tumerol (alcohol), d-alpha phellandrene, carvone, camphor, curcumone; fat, 3%; starch, 30%; resin; curcumin (pigment). - Yields three curcuminoids - curcumin (diferuloylmethane, the primary constituent, responsible for the vibrant yellow color), demothoxycurcumin and bisdemethoxycurcumin - plus volatile oils (tumerone, atiantone and zingiberone), sugars, proteins, and resins. - Yellow orange color comes from yellow pigment in the rhizomes called curcumin. - A good source of phosphorus and iron; but hardly a fair source of calcium. - Pungent and bitter tasting, warming, carminative. - In Chinese medicine, believed to Improve Ch'i circulation. - Studies have demonstrated various therapeutics effects: antioxidant, anti-inflammatory, cholesterol-lowering, antibacterial, anti-fungal, antiviral, immunomodulatory, hepatoprotective, and anticarcinogenic activity. - Antiinflammatory activity has been compared to topical hydrocortisone. - Antiseptic, anti -contusion, antibacterial, antifungal. - Aromatic, stimulant, tonic, cordial, emmenagogue and astringent. - Rhizomes are used medicinally, as powder, paste, ointment, oil, lotion, inhalant, and confection. · Collect the whole year round. · Rinse, removes roots, section into pieces, steam and sun-dry. • Condiment, ingredient of curry powder, and coloring for food. • In dried or powdered form, used like ginger. • Good source of phosphorus and iron, a fair source of calcium. • In Java, flour is made from the plant is the same way as cassava and arrowroot, used for all kinds of dainties. · Decoction of rhizome, as tea, used for fevers, dysentery, abdominal pain, flatulence, abdominal spasm, arthritis. · In the Philippines, rhizomes with coconut oil used as stomachic and vulnerary. · Internally, juice of fresh rhizome used as anthelmintic. · Used for menstrual irregularities, contusions and associated painful swelling. · Antiseptic for wounds: Crush rhizome and apply to wounds. · Externally, rhizomes are applied to insect bites, ringworm, bleeding. · A 1:20 decoction used in catarrhal and purulent ophthalmia. · In India, used as antiseptic for cuts. Used for leprosy, liver problems, swelling, insect bites, wounds, whooping cough, pimples. Sweetened milk boiled with tumeric is popular as a remedy for colds and cough. Juice of fresh rhizome used externally on wounds, bruises and leech-bites. · Tumeric paste mixed with a little lime and saltpeter is applied hot to sprains and bruises. · For smallpox and chicken pox, coating of tumeric powder or thin paste applied externally to facilitate scabbing. · Paste made from flowers used for ringworm and other parasitic skin infections. · Ointment used in neuralgia and rheumatism. · Rhizomes with coconut oil used as stomachic and vulnerary. · Rhizome used for intermittent fevers, flatulence,, dyspepsia. · In Ayurveda, use as stomach and liver tonic and blood purifier. · Malays use it as carminative and for dispelling flatulence. · In China used for colic, amenorrhea, congestions. · Fumes of burning turmeric used as inhalation in catarrh and severe head colds. · For flatulence in children, used with garlic or onions. · Used as carminative and antispasmodic, and in diarrhea and dysentery. • Cosmetic: In Sudan, rhizome used as cosmetic. - Improves Qi (chi) circulation. Chi is the basis of traditional Eastern medicine. In Chinese parlance, chi means 'spirit.' In new-age speak, good health is synonymous with free-flowing energy through meridian pathways. A blocked Qi flow is associated with disease or ill-health. - Approved by German health authorities for the treatment of dyspeptic complaints. - Ointment: Wash the unpeeled ginger. Chop the rhizomes to fill half a glass of water. Sauté with one glass of coconut oil on low heat for five minutes. Place in a clean bottle and label. - Antiseptic for wounds: Extract juice of the fresh rhizome and apply directly on the wound or swelling. Gas pain in adults: Decoction from thumb-sized rhizome in a glass of water reduced to half. • Biologic Activities: An overview of the biologic activities lists in vitro anti-parasitic, anti-spasmodic, anti-inflammatory and gastrointestinal effects; also, inhibition of carcinogenesis and cancer growth. In vivo, studies show anti-parasitic, anti-inflammatory potency of curcumin and extracts in animal models. • Gastrointestinal Effects: C. longa exert several protective effects on the gastrointestinal tract: (1) Sodium curcuminate inhibited intestinal spasm (2) p-tolymethylcarbinol, a turmeric component, increase gastrin, secretin, bicarbonate, and pancreatic enzyme secretion. (3) An antiulcer effect with significant increase of gastric wall mucus in rats subjected to a variety of gastrointestinal insults. • Freeze Dried Rhizome Power in Milk / Triple Effect: Study showed antidiabetic, hypolipidemic and hepatoprotective effects of C. longa freeze dried powder dissolved in milk. Results suggest a potential for an effective and safe antidiabetic dietary supplement. • Essential Oils / Antioxidant: Study of essential oil showed the major compounds to be ar-turmerone (43.04%), humulene oxide (16.59%) and ß-selinene (10.18%) for C. longa. In comparative antioxidant activity with C. sichuanensis and C. aromatica, C longa showed the highest EC50 value on antioxidant activities. • Curcumin / Control of Oxidative Stress in Diabetic Rats: Study showed feeding of curcumin to diabetic rats controlled oxidative stress by inhibiting the increase of TBARS and protein carbonyls and reversing altered antioxidant systems despite unaltered hyperglycemic status. • Anti-Inflammatory: Studies have identified a number of different molecules involved in inflammation that are inhibited by curcumin, including phospholipase, lipooxy- genase, COX-2, leukotrienes, thromboxane, prostaglandins, nitric oxide, collagenase, elastase, hyaluronidase, MCP-1, interferon-inducible protein, tumor necrosis factor, and in- terleukin-12. - Rhizomes commonly sold in markets. - Essential oils and capsules from the cybermarket. Early human safety study of turmeric oil (Curcuma longa oil) administered orally in healthy volunteers / Joshi J, Ghaisas S, Vaidya A et al / J Assoc Physicians India. 2003 Nov;51:1055-60. Sorting Curcuma names / Maintained by: Michel H. Porcher / MULTILINGUAL MULTISCRIPT PLANT NAME DATABASE / A Work in Progress/ The University of Melbourne. Australia / Copyright © 1997 - 2000 The University of Melbourne. Curcumin, an active constiuent of the ancient medicinal herb Curcuma longa L.: some uses and the establishment and biological basis of medical efficacy. / Witkin JM, Li X. / CNS Neurol Disord Drug Targets. 2013 Jun;12(4):487-97. Anti-platelet effects of Curcuma oil in experimental models of myocardial ischemia-reperfusion and thrombosis. / Prakash P, Misra A, Surin WR, Jain M, Bhatta RS, Pal R, Raj K, Barthwal MK, Dikshit M. / Thromb Res. 2011 Feb;127(2):111-8. doi: 10.1016/j.thromres.2010.11.007. Epub 2010 Dec 8. Toxicity prediction of compounds from turmeric (Curcuma longa L). / Balaji S, Chempakam B. / Food Chem Toxicol. 2010 Oct;48(10):2951-9. / doi: 10.1016/j.fct.2010.07.032. 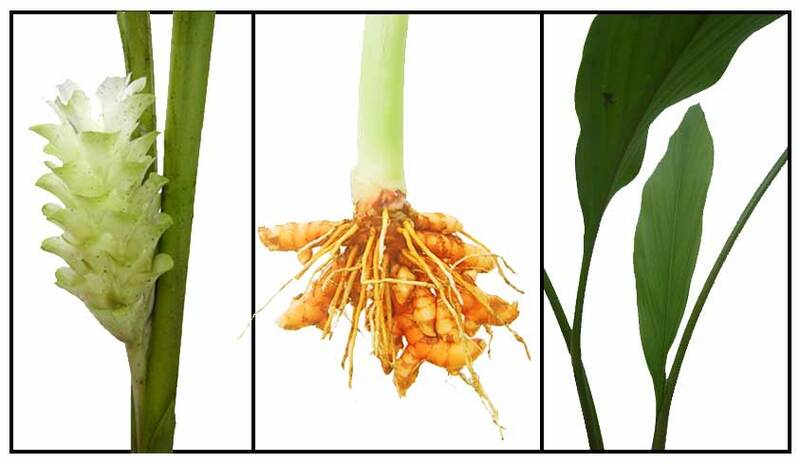 ANTIBACTERIAL ACTIVITY OF CURCUMA LONGA VARIETIES AGAINST DIFFERENT STRAINS OF BACTERIA / SHAGUFTA NAZ*, SAFIA JABEEN, SAIQA ILYAS FARKHANDA MANZOOR, FARAH ASLAM AND AAMIR ALI / Pak. J. Bot., 42(1): 455-462, 2010. Histological evaluation of Curcuma longa-ghee formulation and hyaluronic acid on gingival healing in dog. / Ghanbari Habiboallah, Saghravanian Nasroallah, Zakery Mahdi, Mahdavi Shahri Nasser, Zakery Massoud, Baradaran Nasseri Ehsan, Zareian Jahromi Mina, Parsaei Heidar / J Ethnopharmacol. 2008 Dec 8;120(3):335-41. Anti-inflammatory effect of Curcuma longa (turmeric) on collagen-induced arthritis: an anatomico-radiological study. / Taty Anna K, Elvy Suhana MR, Das S, Faizah O, Hamzaini AH / Clin Ter. 2011;162(3): 2017. HEPATOPROTECTIVE ACTIVITY OF AQUEOUS EXTRACT OF CURCUMA LONGA IN ETHANOL INDUCED HEPATOTOXICITY IN ALBINO WISTAR RATS / Ishwin Singh, S Vetriselvan*, J Shankar, S Gayathiri, C Hemah, G Shereenjeet, A Yaashini / International Journal of Phytopharmacology. 3(3), 2012, 226-233. Efficacy and safety of Curcuma domestica extracts compared with ibuprofen in patients with knee osteoarthritis: a multicenter study / Kuptniratsaikul V, Dajpratham P, Taechaarpornkul W, Buntragulpoontawee M, Lukkanapichonchut P, Chootip C, Saengsuwan J, Tantayakom K, Laongpech S / Clinical Interventions in Aging, Vol 9, March 2014: Pages 451—458 / DOI https://doi.org/10.2147/CIA.